Remember this? 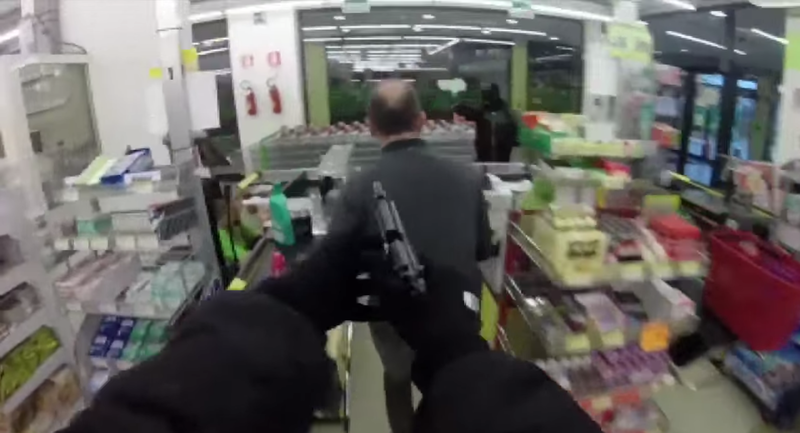 Go-Pro wearing robber terrofies shoppers in Italy. Using data compiled from videos created by GoPro cameras mounted onto the helmets of 34 different subjects, researchers Yedid Hoshen & Shmuel Peleg of Cornell University were able to identify unique signatures in the differentiating wobble from just four seconds of camera footage. This, they say will compromise ego-centric (mounted) camera wearers anonymity, although it could have some benevolent uses. Your newly purchased camera can be tailored to recognise only your movements which may prevent some thefts, or user analytics on video sharing websites. One of the Go-Pro Hero3 cameras mounted to a baseball cap. The experiment has only so far been performed with baseball cap mounted Go-Pro cameras but researchers plan on expanding the tests to include Google Glass and body mounted surveillance cameras such as those soon to be in use after the order of 50,000 units for the US police force was approved. We’re one step closer to Completing the Circle, although I have to admit to not considering this method of surveillance before. Scary stuff or much needed improvements in tech? Leave your comments below.